Ghanaian popular Bodybuilder William Kankam, has said lack of finance is affecting Ghana bodybuilders. In an interview Rainbow Radio’s Isaac Wallace on Rainbow Sports, he said, access to funds has become their biggest problem so he is urging the government or the individuals, corporate bodies to come to their aid ‘’because if you go into a tournament you represent Ghana and if Ghana is not helping you, then it is very painful,’’ he added. He disclosed bodybuilders, who represent the state in competitions, have to pay for their own hotel, tickets and other costs. 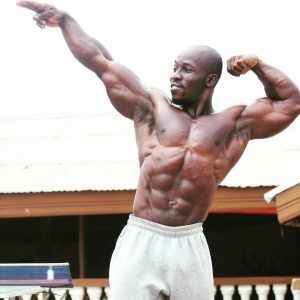 William Kankam said he nearly changed his nationality due to the neglect of the body building sport but for the love he had for his country, he changed his mind. He also admonished the media to give more attention to activities of body builders and also make their challenges known so they would receive help from government and the private sector. Body-building, described as use of progressive resistance exercise to control and develop one’s muscles has become a competitive sport over the years. In Ghana however, the art has unfortunately become synonymous to violence and sometimes crime. Snatching of ballot boxes during elections and land-guard activities are two major areas of concern that body-builders have been associated with. But William Kankam disputed the claims and insisted that, body builders are not troublemakers.